The booklet auto is numbered ONE of TEN! And both cards are on card autographs. A lot of people don’t think that is such a big deal, but I like the on card autos better because that means that the signer actually saw the card and touched it. Unlike sticker autos where they just signed a sheet of stickers. Paula knows that I am a huge Magic Johnson fan and she comes across a lot of awesome sports cards as she owns Paula’s Sports Cards, Etc. in Makiki Shopping Plaza. 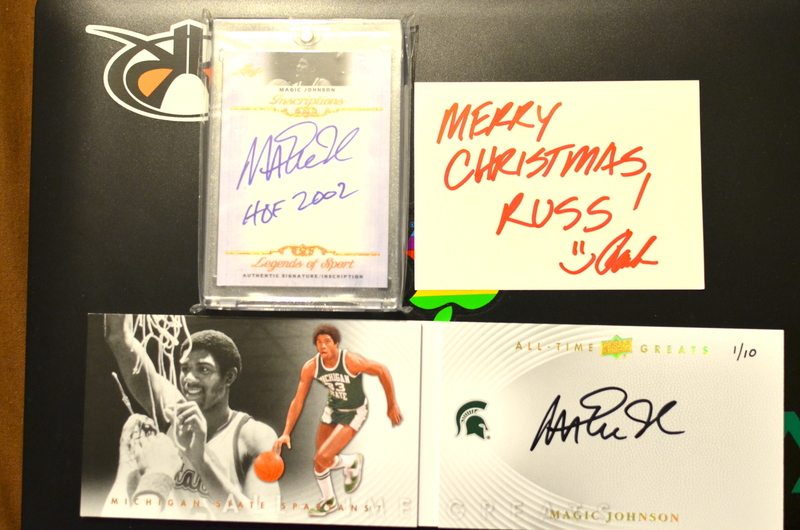 I setup her website and some social media accounts (@Paulas808 on Twitter, @Paulas808 on Instagram) for her a few years back and even though she totally doesn’t have to do this she buys these special cards from people who open packs at her place and who are not Magic Johnson fans themselves. Earlier this year, out of the blue, she gave me this card. And it totally blew me away! It is a card that I always admired in photos from others, but never thought I would ever be able to own one of my own. For those of you who don’t know what you’re looking at, this card is considered Magic Johnson’s Rookie Card. BUT this one is autographed by all three players. 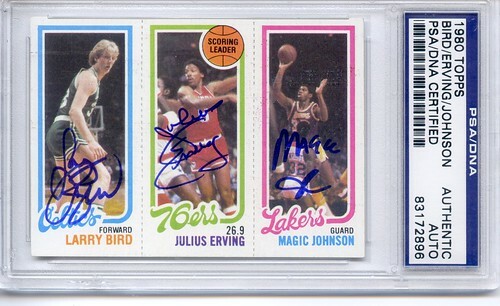 Magic, Dr. J, and that other guy. And it has been authenticated and sealed by one of the most reputable authentication firms out there. There are no words to describe how incredibly touched I was that she would give this to me. She (and Keith) are amazing people and I am honored to know them. She claims she does it because I help her with her website but I don’t do anything near enough to deserve this level of compensation. She is one of a kind. Mahalo Paula for all that you do for me (and my Magic Johnson collection)! If you get a chance and are into sports cards or World of Warcraft or Magic or etc and have never been there, look her up! There are some amazing stuff that comes out of her shop that I’ve seen people worldwide comment that they don’t believe is real. Everything posted is 100% authentic and have come from her place.